These helical spiral cutterheads feature four spirals and replaceable carbide inserts for providing an incredible finish. Helical heads not capable of rabbeting. Good product and worth the money but you need to understand the big picture before you purchase. The pulley and bearing blocks from the old cutter are reusable but the old bearings are not. 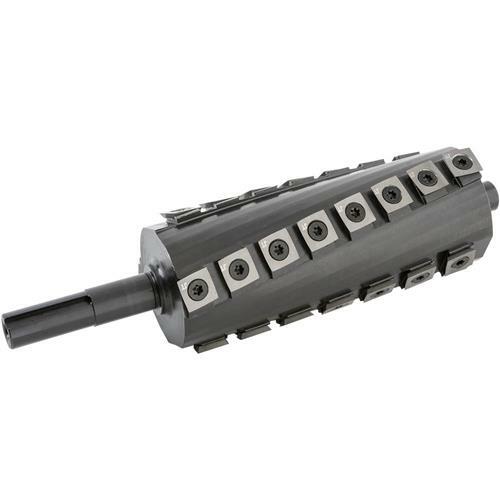 Purchase new bearings when you purchase this cutter head (they are not available from Grizzly) and recognize they must but "press fit" on the new cutter head and into the old bearing blocks. Do not attempt to "beat them on" with a hammer. This part of the process is not discussed in the catalog nor is it discussed in the installation instructions. 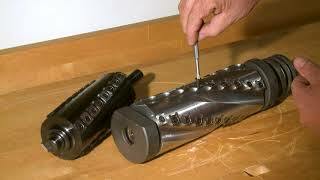 Careful installation of these bearings is, however, critical to the successful replacement. In service this is a revolutionary new cutter design that will change you attitude about that old jointer.